Unlike a rainstorm during the warmer months, your fence won’t get many warm days to dry out during the winter. Staining your wood fence during the fall is your best defense. Once temperatures drop, it becomes more difficult for the fence to dry out enough to reach the ideal moisture level for applying stain (11%). Our fence staining experts perform a moisture test before applying stain to make sure the fence will properly take the stain. Bushes, leaves, and other organic debris collect moisture and snow, which could cause rotting or deterioration to your wood fence. 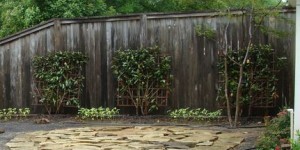 Bushes and shrubs should be trimmed back, and away from the fence. Leaves should be raked away and not left to accumulate near the fence. Heavy precipitation can cause water to soak into the soil and form sinkholes, landslides and shifts that could impact your fence’s posts. You can run a string along the top of the fence to make sure it’s still level. 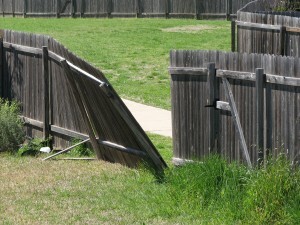 If it’s not, you’ll need to address this issue right away by having your fence repaired. Post shifting indicates that there is a problem, and if not taken care of immediately, will lead to costly repairs later on. Be sure to inspect your fence after every storm to make sure there is no damage. 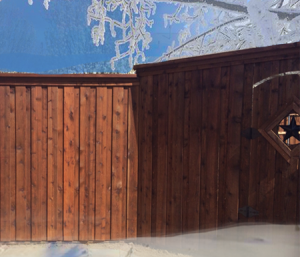 Like the rest of the yard, a wood fence can easily become neglected during the winter. With these few small measures of prevention now, you can minimize damage to your fence and help keep your fence strong enough to withstand major storms in the spring. Schedule Your Free Fence Estimate!